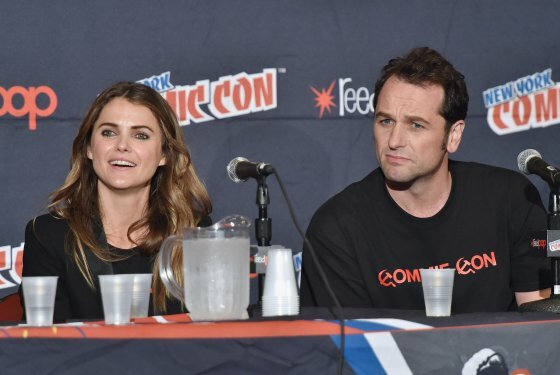 Backstage, after the conference, Matthew Rhys and rumored girlfriend and co-star Keri Russell were ambushed for a short interview. When asked how was the feeling of attending a comic con for the “first time”, Rhys exclaimed, “It was generalized, it was a new fan experience for me”.Russell was asked how she thinks about everything that’s going on with the show. “It was interesting, fun, enjoyable show and even weird in all the right ways”. Finally, the question on how they want their daughter Paige to lead on, Phillip made a big NO, he said, “who would put their child in any line of danger”. This means we probably won’t see a change of heart when it comes to Paige being a KGB agent. This can’t be said with Elizabeth. As she was firm about training her daughter to become like her. On another perspective, as everything seems amplified by the end of the last season, this can also put an end on the secrecy aspect that lures and affects their relationship per se. Talking about complexities of the characters, at the beginning, Phillip was seen to be more gentle, soft and there’s warmth on his character, not that he is cold now, but by the end of season, we see a darker version. “It’s taking its toll on the repetitive cycle of violence that they do, it starts to manifest, and since it’s a cycle he can’t get off, that’s why he’s falling into darker place”, Rhys said. Going into next season, what are we hopeful for? “Costumes before the star! !”, revealed Rhys. On the comic con, while it was, perhaps, intended to focus heavily on the upcoming third season, much of the 45 minute affair, focused on the show in general. If you were looking for specifics, you were going to walk away disappointed from the panel. No secrets whatsoever were divulged about what the future is going to hold, specifically, for any of the characters – either those present or not present. One of the big points that they struck on early in the panel was the fact that the upcoming season will focus more on the parenting struggles our two spies experiences. Those struggles have certainly been seen in the past, but may be more-front-and-center than any marriage strife Elizabeth (Russell) and Phillip (Rhys) have for other reasons. We also know, as Mahendru was present for the panel, that Nina has survived her predicament. At least, she has survived long enough to be alive for the third season premiere. During the Q&A portion, a question was asked about what the characters reactions would be to the end of the Cold War. Mahendru felt as though Nina’s would be happy… mostly because that would mean she lived that long.